Very Good. 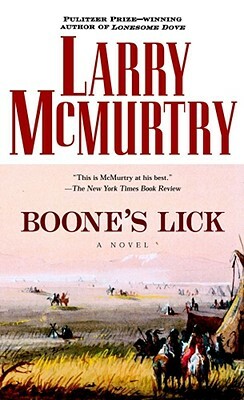 Boone's Lick by McMurtry, Larry. Mass market (rack) paperback. Glued binding. 288 p.
Good. Boone's Lick by McMurtry, Larry. Mass market (rack) paperback. Glued binding. 288 p.
Very Good. Trade paperback (US). Glued binding. 288 p. Master storyteller McMurtry unfurls a bright banner of a book following the fortunes of the Cecil family as they travel from Boone's Lick, Missouri, to the Western frontier. Fifteen-year-old Shay narrates, describing the journey that begins when his Ma decides to hunt down her elusive husband to tell him she's leaving him. Very Good. Sewn binding. Cloth over boards. With dust jacket. Fifteen year old Shay narrates this novel, describing the Cecil family's arduous journey by riverboat and wagon from Boone's Lick, Missouri, to Fort Phil Kearny in Wyoming. It follows their family's encounters with grizzly bears, stormy weather and hostile Indians. Good. Sewn binding. Cloth over boards. With dust jacket. Fifteen year old Shay narrates this novel, describing the Cecil family's arduous journey by riverboat and wagon from Boone's Lick, Missouri, to Fort Phil Kearny in Wyoming. It follows their family's encounters with grizzly bears, stormy weather and hostile Indians.